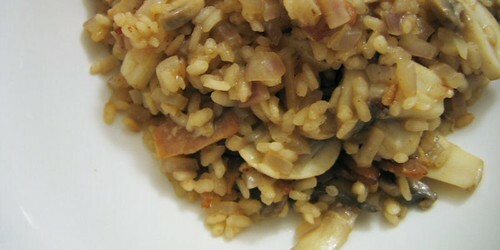 Posted on March 4, 2005 by Christine D.	This entry was posted in Photography, Savoury and tagged delicious, Food, Food Photography, foodporn, Recipe, recipe:ingredient=Bacon, recipe:ingredient=Mushrooms, recipe:ingredient=Onions, recipe:ingredient=Rice, risotto. Bookmark the permalink. Oooh, mushrooms and bacon? I am going to have to take this one for a spin. What are the dark rice looking pieces in the picture?